MediaTek has officially taken wraps of its newest chipset, dubbed MT6592, which is a true octa-core solution for the mobile platform. The MT6592 features an advanced eight-core processor that is said to have a better balance between performance and the power consumption. MediaTek's latest addition is designed to deliver a premium gaming experience, advanced multi-tasking, and enhanced web browsing performance for high-end smartphones and tablets. The chipset is built on the 28nm architecture with each of its eight cores capable of clocking up to 2GHz. 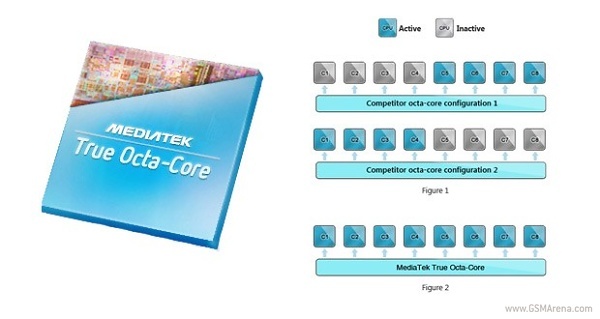 The advanced MediaTek scheduling algorithm will monitor the temperature and the power consumption of the SoC to make sure that chip delivers optimum performance. There's a multimedia subsystem with a quad-core graphics engine and a video playback system that supports up to 4K Ultra-HD playphone. The chipset can also support up to a 16 megapixel camera and fullHD display. Furthermore, MediaTek's ClearMotion technology converts the 24/30 fps video to 60fps and ensures smoother playback. An advanced multi-mode cellular modem is incorporated in the MT6592 along with the dual-band 801.11n Wi-Fi, Miracast screen-sharing, Bluetooth, GPS and an FM tuner. MediaTek MT6592-powered smartphones running on Android Jelly Bean are expected by the end of this year, while devices with Android KitKat will make it to the market in early 2014.
at least it is 75%-80% of adreno 320 with it's 700mhz speed. also it's not fair to compare a high class & openGl 3.0 supported gpu to mid class gpu.